I gave his unbelievably simple recipe a try. In what has to be more than 25 years since I got that letter (we’re talking pre-Internet, pre-Pinterest … maybe pre-historic ), I’ve used nothing else to clean tubs, showers, sinks, toilets, patio furniture—just about anything that will stand still long enough to get sprayed, and can be rinsed easily. This must be rinsed off. 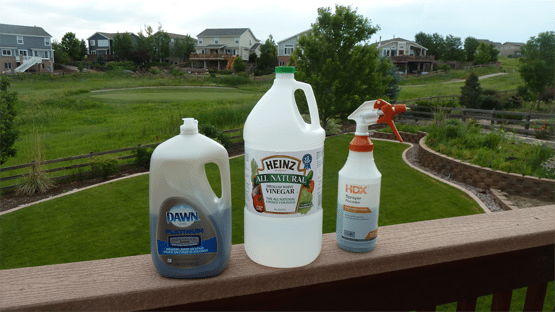 Pour one cup blue Dawn into a 32-ounce spray bottle; 1/2 cup Dawn if you are using a 16-ounce bottle. Fill the bottle the rest of the way with white vinegar. (Or one-part blue Dawn to three-parts vinegar, regardless of the size of the spray bottle.) Apply sprayer top; shake gently to mix. While this Tub, Tile and Shower Cleaner works to loosen and remove most mildew, if you see a lot of black growth you will want to pretreat with full strength liquid chlorine bleach* before proceeding as above. Here’s the best thing about this cleaner—if you use it weekly you will never have to scrub again. Once each week I spray down the walls, doors, tracks, faucets, shampoo caddy—everything within reach—with this magical cleaner while I am in the shower*. Before I step out, I use the handheld sprayer to rinse it all away. No scrubbing required. It dries sparkling clean without using a squeegee or wiping down with a towel. And not a watermark to be seen. Simply brilliant! By the way, this homemade product works in other areas of the house, too. I’ve used it to remove watermarks that show up on the refrigerator’s in-door water dispenser area (letting it sit for a while then rinsing very well), the sink and faucets, too. 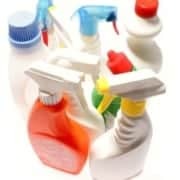 I can’t wait to get your feedback once you give this super simple cleaning and maintenance homemade product a try. Before and after pictures would be great! 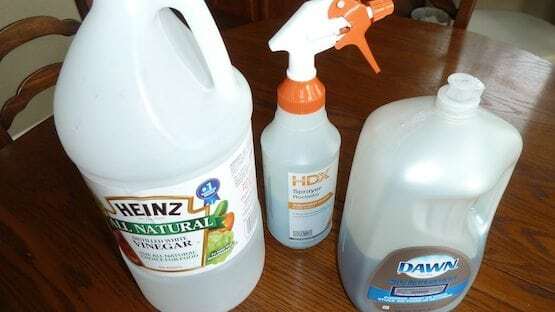 CAUTION: Never, ever allow chlorine bleach to come in contact with other products, especially vinegar. This could produce chlorine gas, which is deadly. Don’t panic. 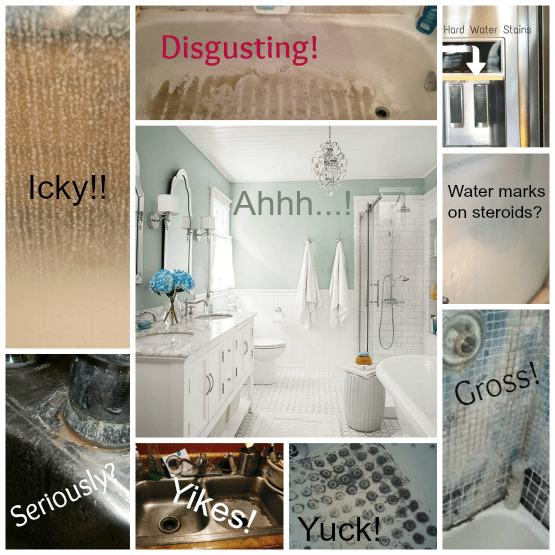 Simply make sure you rinse the chlorine bleach away completely before proceeding to clean with this awesome homemade tub, tile and shower cleaner. CAUTION: Always make sure you are using a non-slip rubber mat in the shower or tub before attempting in-shower maintenance! CAUTION: Never use this on granite shower walls or countertops as vinegar can damage the sealant that makes granite look so beautiful. Granite needs to be re-sealed annually. Don’t forget! Alternatively, in this recipe, you can substitute rubbing alcohol for white vinegar. Just don’t expect the same dramatic, magical results.